Home » Religious Deception » Philo of Alexandria and other ancient bible writers: Source of deception? Fifteen years of Following Philo–pulling threads from ancient texts, inscriptions, marble busts, and other artifacts – led to the history hidden in myths and fictions. “The Nazarean and the Magdalene” were not what we expected – in fact, they are much betterthat we expected. Their work promoting compassion for the poor and love for humankind lasted decades longer than anyone has ever known. “Saulus known as Paulus” was much worse than we expected, and we’ve never held out much hope for his loyalty to the message delivered by The Nazarean and The Magdalene. But each of you will have to judge for yourself. Some, I fear, may be too attached to long-held perceptions of “Yeshua” to be able to let go of Him. We must confess that we bear the blame for promoting some of these misperceptions. In the beginning stages of our research, I refused to believe some of what we found, evidence that challenged our longest-held and most treasured conclusions. But the evidence grew until it became overwhelming and indisputable. I had to accept it, and the time has come to share it. The name chosen for the descendants of the First Father of Earthlings and his Sons unites YHWH and Zeus: He was called “YaH-Zeus.” In biblical Hebrew, the Daughters of the First Mother of Earthlings were called “BaT eL Ha eM” (“daughter of El the Mother”). In OT stories they are introduced next to a well or a spring getting water their flocks. Rachel was among the first, and her burial, marked by a pillar (Gen 35:19-21), reveals the genesis of “The Magdalene.” In Biblical Hebrew, “Watchtower of the Flock” (Gen 35:21), is MGDL DR”. (Note: Only the issue on the validity of the name is in issue in this article). Based on the above findings, while Christians would readily accept the name Iēsous, which is the Greek origin of Jesus, as the name of the messiah without hesitation, logic would simply reveal that the name was just created by ancient writers to appease the conflicting Jews and Romans, with no Hebrew or Aramaic origin, at all, because Zeus was never one of the gods of the Israelites or there was no combination of the two names at the time the messiah was born until he was crucified. Also, this would indicate how Philo of Alexandria and other ancient writers underestimated the importance of the name of Christ, by replacing it with combination of YHWH and Zeus. In short, the name Iēsous was just created by well-known family of Israelites, which include the family of Philo of Alexandria, and the Romans. 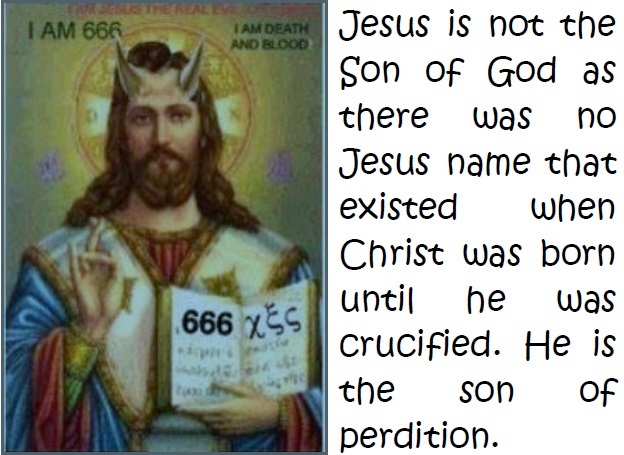 Therefore, it is grave error to believe in the name Iēsous as the messiah’s name and more erroneous to believe on the name Jesus because in the latter, the ‘Yah’ is eliminated. Thus, the belief on the name Jesus is very fatal because Christians are eliminating the name of God of Israel to finally promote only the name of the Greek pagan god Zeus. By aaphil in Religious Deception, The Word on October 26, 2015 .